Take up the fight against Dry Skin! Sukin`s nourishing nightly moisturiser is enriched with Rosehip and Kakadu Plum to provide long and short-term hydration, while Quandong, Camellia and essential fatty acids work to revitalise tired skin, leaving your skin feeling rejuvenated and radiant each morning. Water (Aqua), Aloe Barbadensis Leaf Juice, Sesamum Indicum (Sesame) Seed Oil, Glycerin, Cetearyl Alcohol, Cetyl Alcohol, Ceteareth-20, Rosa Canina Fruit Oil (Rosehip), Tocopherol (Vitamin E), Terminalia Ferdinandiana Fruit Extract (Kakadu Plum), Pleiogynium Timoriense Fruit Extract (Burdekin Plum), Podocarpus Elatus Fruit Extract (Illawarra Plum), Santalum Acuminatum Fruit Extract (Quandong), Borago Officinalis Seed Oil (Borage), Oenothera Biennis (Evening Primrose) Oil, Camellia Oleifera Seed Oil, Citrus Tangerina (Tangerine) Peel Oil, Citrus Nobilis (Mandarin Orange) Peel Oil, Lavandula Angustifolia (Lavender) Oil, Vanillin, Phenoxyethanol, Benzyl Alcohol, Limonene*, Linalool*. After cleansing in the evening gently massage into face, neck and décolletage. If irritation occurs rinse immediately and discontinue use. Patch test before use. 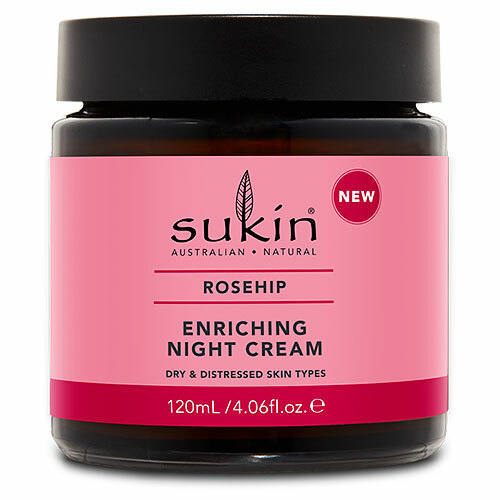 Below are reviews of Sukin Rosehip Enriching Night Cream - 120ml by bodykind customers. If you have tried this product we'd love to hear what you think so please leave a review. Sukin`s nourishing nightly moisturiser is enriched with Rosehip and Kakadu Plum to provide long and short-term hydration, while Quandong, Camellia and essential fatty acids work to revitalise tired skin.